Hi and Welcome to Adventures of a Busy Bee! 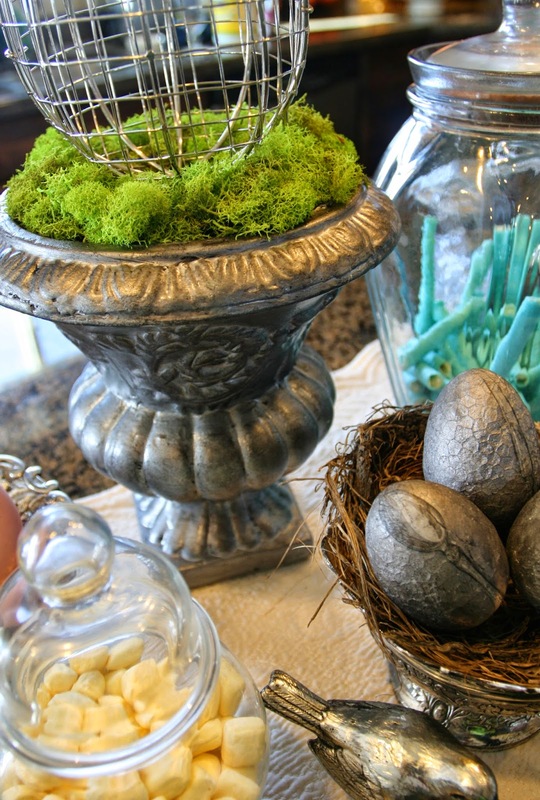 I saw a pinterest link for an idea to use hot glue and paint on plastic eggs a month or so ago, and I was intrigued! 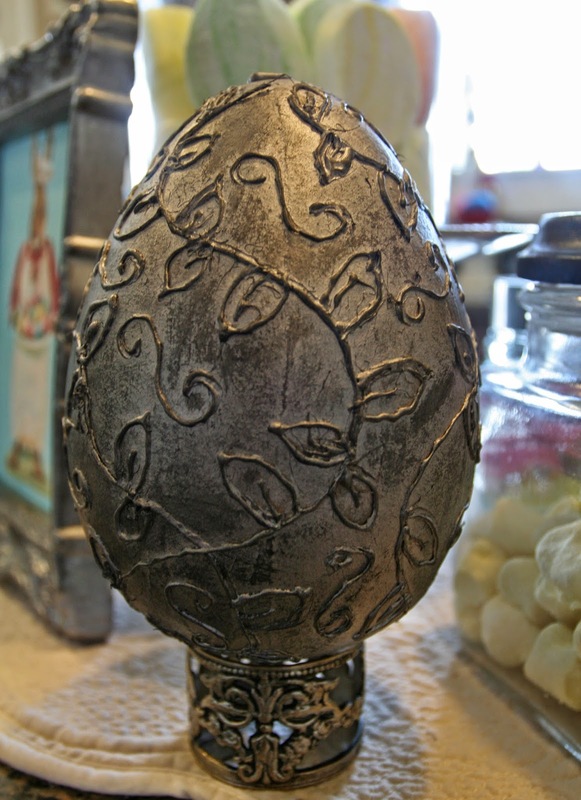 I had already planned on using my silver pieces to display eggs on my Easter island, but this idea just took it up a notch! The link took me to a website called Magia Mia. She's got some great fun ideas and I love perusing her other creations. Good stuff. 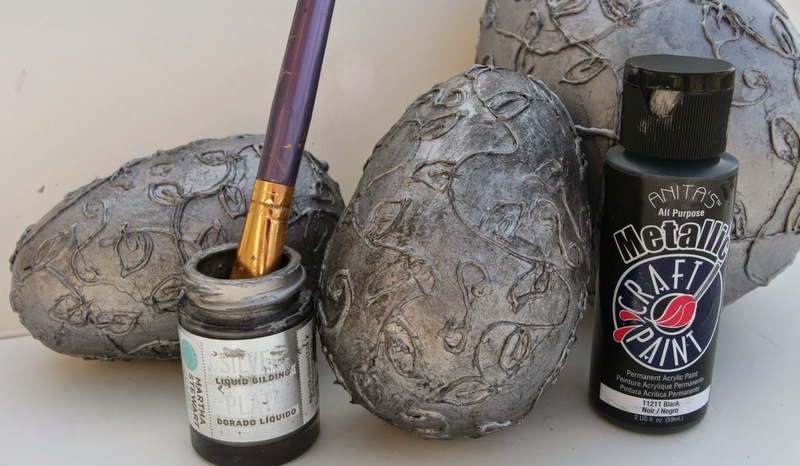 So, anyway, I did not want to use plastic eggs that were in 2 pieces like she had done, so I pulled some paper mache eggs out of my supply, and decided to use those. 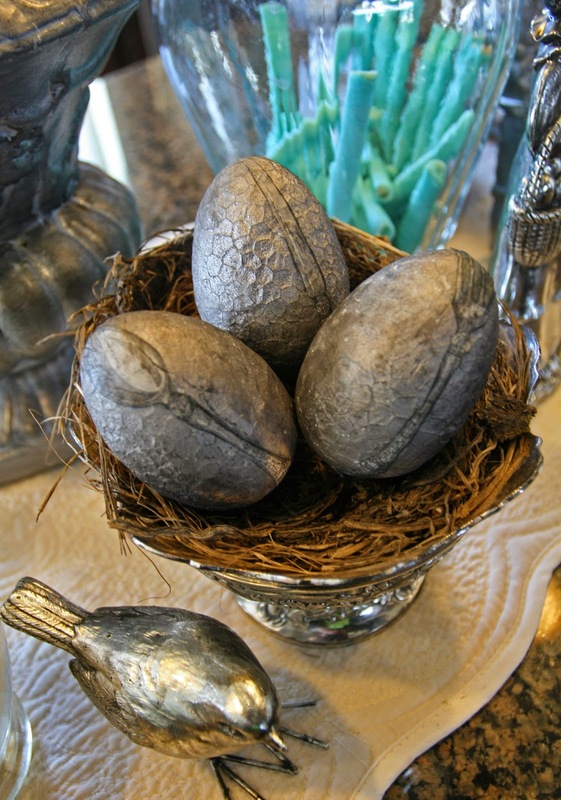 Happily, when I was at Hobby Lobby the next day, I found an even BIGGER paper mache egg to use as well. Though my other ones are about 3 times the size of a regular egg, this one is 6 or 7 times the size. It was perfect. 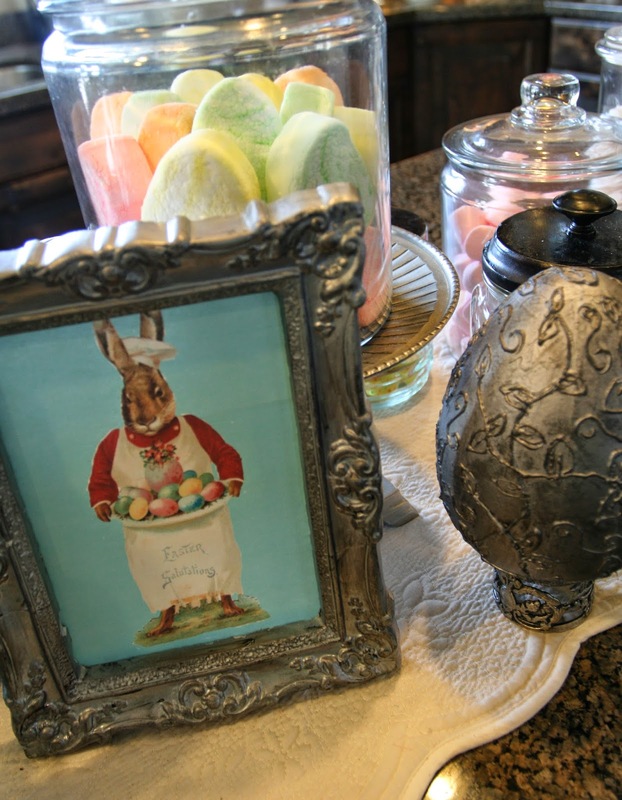 It's next to my framed bunny print in this pic...which is an image I found online and made up in PicMonkey...he's so perfect with all the colors of marshmallows, eggs and candy I have in jars as part of the display. I also painted that frame the same way as the other faux metal things...and it is ceramic, believe it or not! 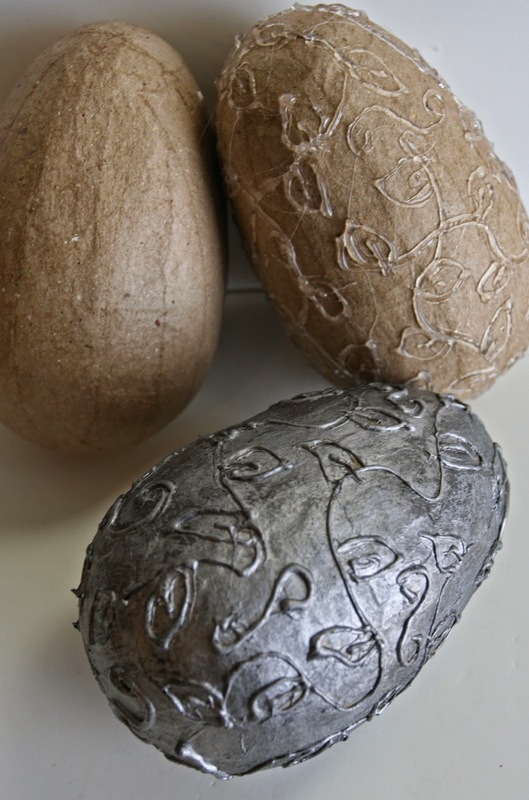 Now, I'll show you the other eggs in just a minute, but in the meantime, look at these ones that I did using images from a paper napkin! I cut out the Knife, fork and spoon and attached them with glue to the styrofoam eggs that I used for this technique. Okay, now to show you the eggs, and then later, the Bunnies. Here they are in their vintage silver jewelry box, that I re-purposed just for them! And this is what they looked like in process: one plain, one painted and one with the glue lines. 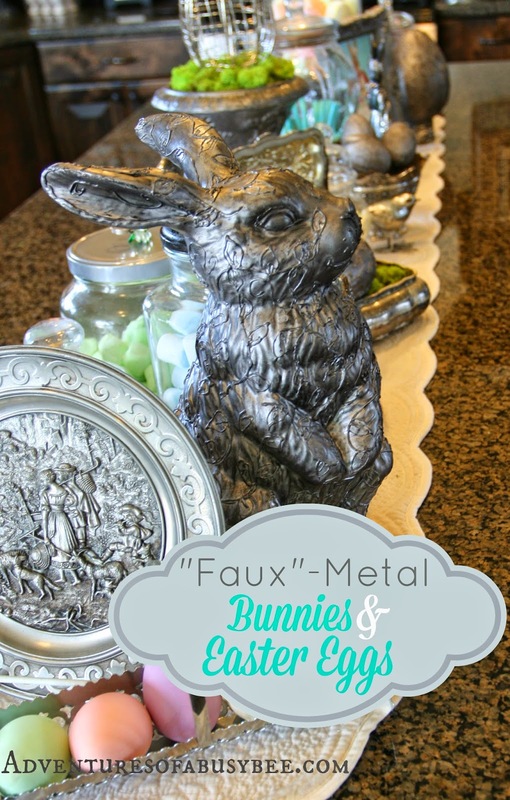 And all done, showing the products that I used to finish them, and the bunnies: The black paint is metallic so it didn't dull the finish too much, and the Liquid Gilding was my answer to dealing with messy Silver leafing and sizing like the original creator had used. This is a little toxic, so I recommend using it outside if possible, or at least venilated if not...and I would recommend NOT using it if you are pregnant. Just my opinion. Anyway, a little goes a long way. I only used about half the bottle for all the things I painted (7 eggs, 2 bunnies, a frame and a vase). I found the silver gilding at Michaels, but I've not seen it elsewhere. The large egg is below. It was the first thing I did, and I did rough out some vine designs with a pencil first. When I did the smaller eggs and the bunny, I just winged it. I have very shaky hands when I'm using them sometimes because I suffer from an inherited "Essential Tremor". So, your efforts will likely be a lot more refined looking. In between the vines where I had open spaces that I didn't like, I drew little swirly's. I also would like to mention that I used my wonderful little hot melt mini glue gun that has a very narrow tip. A regular glue gun is going to give you much larger lines, plus they will be harder to define. I suggest getting one of the specialty ones with a coupon. It's my go-to Glue gun because I love the control I have with it. Additionally, rather than using glue just for hot-melt, I used an all temp glue so it dried faster. You can see my "imperfections"...but really, they aren't noticeable when you look at the whole thing. I placed it on top of a little metal ring that I found thrifting. It's not a napkin ring because it has little pieces of metal that stick out on one end, but hey...it works and I love it for this purpose! Let me tell you about Big Bunny. I have had him in my Easter stash for almost 15 years. Seriously. And he was cute like he was. Just white with a pink nose and ears, and painted eyes...pretty realistic looking. 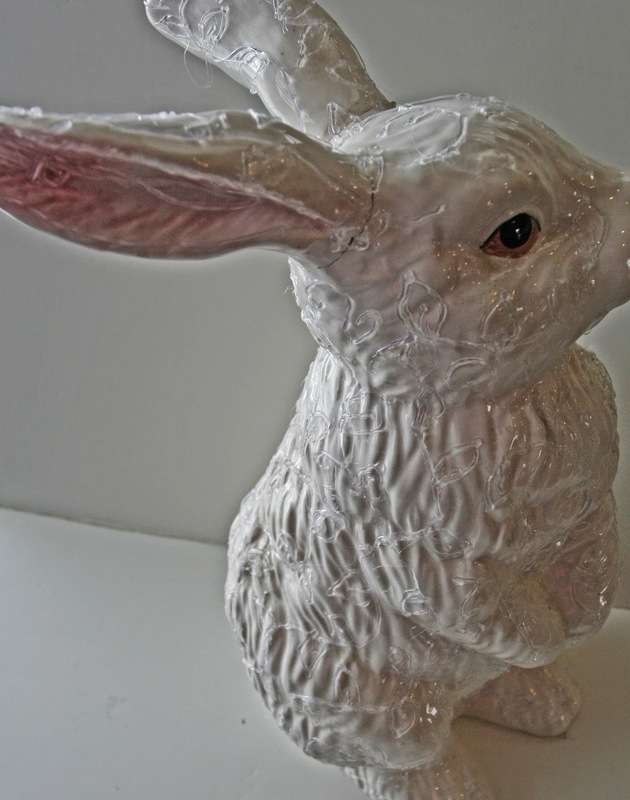 But, Big Bunny had a problem with keeping his ears attached to his body. And this year, when I re-glued them for probably the 4th time, the seams were not pretty. So, I had made up my mind to send him off to the thrift store when true inspiration struck. I decided to try out the same treatment as I did the eggs...and wow am I glad I did! Isn't he cute? Those ear seams are a lot less noticeable now. And another shot. I decided to highlight his eyes, mouth and whiskers with the hot glue before I painted him. I'm really glad I did...I like how it looks. Lastly, here are the two bunnies, treated. 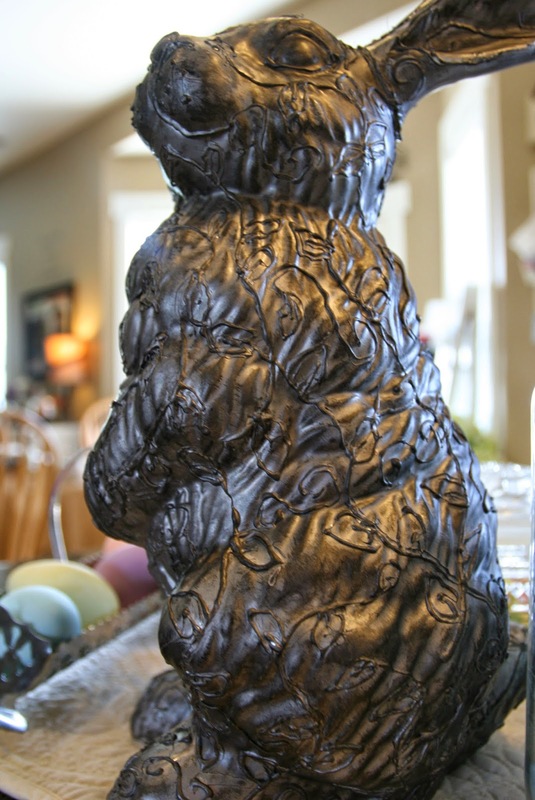 Big Bunny has not yet been painted with the black paint. 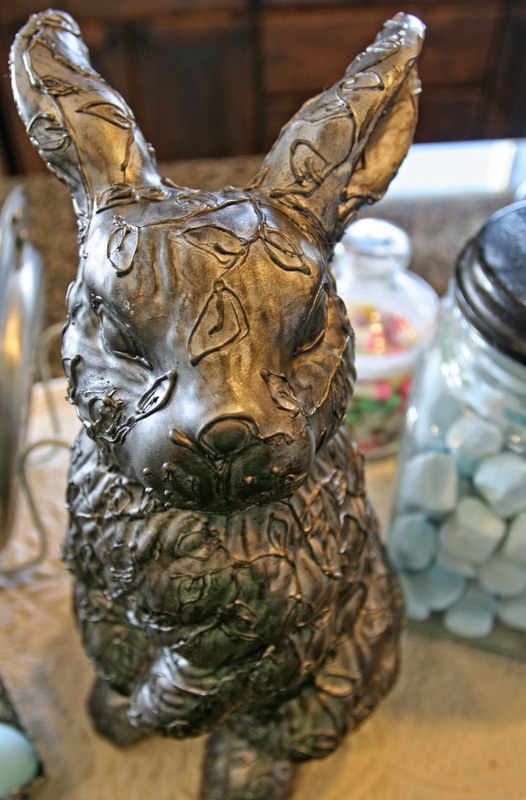 Little bunny just got the metal treatment (gilding and paint), because I was tired of the gluing process by the time I got to him! He's cute anyway, right? He does have an ear seam, which you can see in the pic, but I'll touch it up again. To do the black paint finish, I dry brushed on the paint, and then rubbed it off with a paper towel in sections where it was too dark. You just want to mimic the look of tarnished silver. You can tell the difference when it's not used by comparing these two. 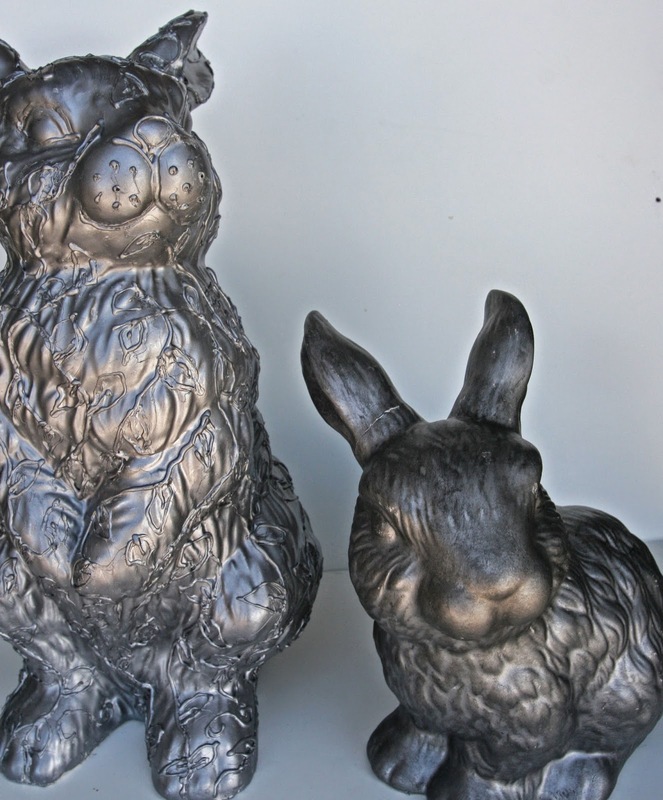 On the island, I also have 4 metal bunnies that are more shiny which I purchased already done that way. Last year I had a little boy bunny pushing a cart. I used him last year on my mantle display, which you can see here. 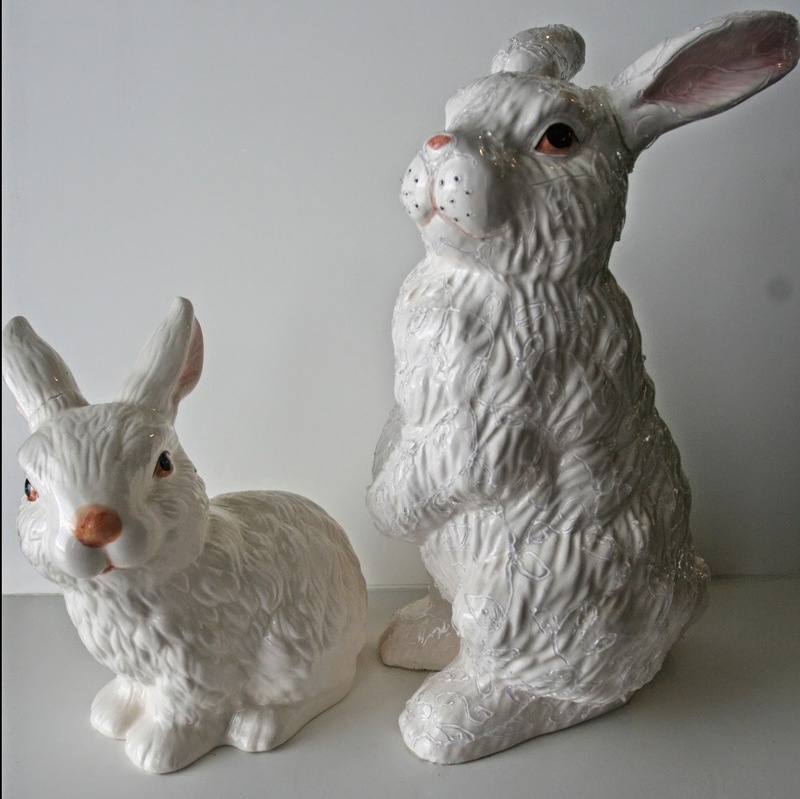 I was THRILLED to find 3 more thrifting this year...a mom, a dad and a little girl bunny. They all had their heads broken off and were in a bag together. So happy and they look great all mixed in with these ones. 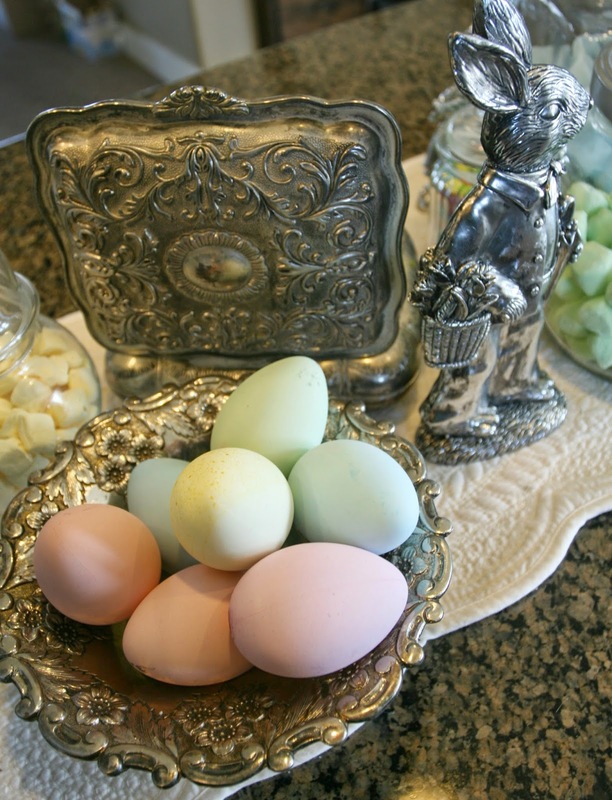 By the way, the eggs in this pic are "Fake" eggs that I found at Walmart this year for $2.00 a dozen...and they dye like real eggs! I did these with Rit Dyes. Pretty fun! 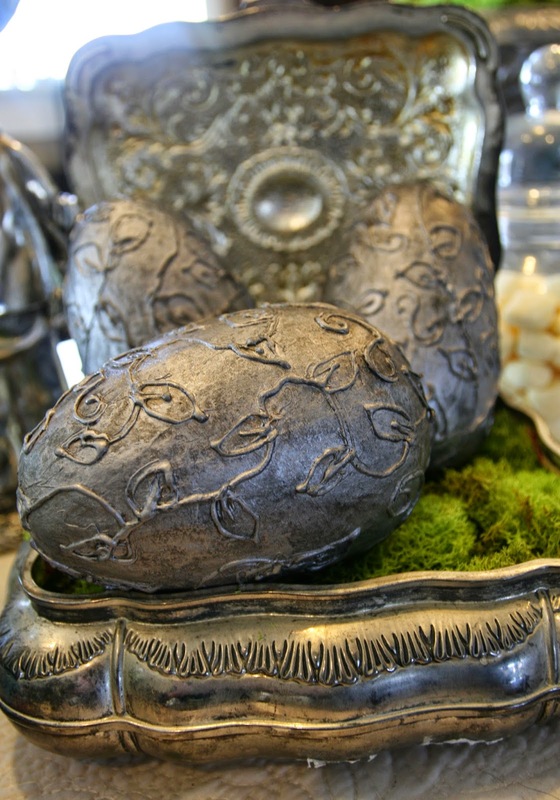 The pretty box is lid of the one that is holding the three "faux metal" eggs. I love how it has so much character...as does the bowl holding the eggs. I hope you're inspired to try this technique too! I have already set aside some other things that I'm going to do it on. I just need to practice my designs so I can break away from the vine look for some of the bigger pieces I have in mind. (and take one of my anti-shaking pills first). I still have a half bottle of gilding so I want to put it to use! How about you? Do you think you might try this technique? Hey there! Thanks for the shout out! Love your results! Hey, thanks Magia Mia! I appreciate you stopping by...and giving me the ideas! I really enjoy your blog!